No, I am not a Buddhist, I am not even sure if these statues are Buddha hehehe. I just remember the "Buddha Bless you" phrase that a former colleague that I knew of sees a buddha statue. 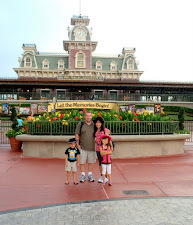 These photos were taken in Orlando Florida during our vacation last year. The statue is so big compared to Mr. Burrito. My family and our family friend went to this Chinese restaurant. This was my first time eating at a restaurant where there is a mandatory 15% gratuity fee hehehe. Oh well, that's the price you pay when you go for vacation. Anyhow, this banana display is cute. I also love the lobster holding the wine glass and carrying the bottle of wine on his back. What do you think about the mandatory gratuity fee? Is it fair to the costumer? Won't tip should be given voluntarily? hahhaha...what a crazy experience! talagang mandatory...oks lang masarap din naman yung pagkain nila...lol! in the lap of Buddha! I dislike mandatory tipping. Tips should be for good service not just because they can. Sometimes I think the server actually looses. I have noticed that mandatory tip in France too. If tips, are for service rendered...then I think they would get more, if they are really doing a good job. I was a waitress in college and I love to give a large tip when it's service over and above. the mandatory tipping is the norm here, it's called service charge, at 10% plus additional 10% government tax. Strange that they would do that-perhaps because too many times patrons tip less than that and the wait staff gets taxed on the gross sales of their section that they work and if they don't get tipped accordingly, they pay that tax out of the hourly wage. But, then, there is no leeway for when the service is not deserving. If it weren't, I'd call the manager over and let them know that it isn't and to remove the 15%. Delicious pictures, I like the Buddha. Greetings. Good to see the Buddha is taking care of Mr Burrito:-) I always wonder whose pocket the mandatory tip goes in, the person whose given the service or the business. I often wonder about that too, Joy! does the mandatory tip really goes to the servers or it goes to the business? Really funny lobster carrying a bottle on the back! Thanks for your comment! Really appreciate it. I always give tips when the waiter or waitress is polite, kind and helpful.